COMMENTS: I love this effect. The handling is clean, straight-forward, and is designed to highlight these aspects even to the untrained eye of the layman. Finally, 1 wanted to take away the sting of the sucker ending, so I now end with the funny kicker of pulling the silk out of the spot that is stuck to your forehead. I feel that it is much better to end with a laugh instead of an "I got you!" PROCEDURES: You need two identical eighteen-inch silks, a circle of tape the same color as the silks, a real egg, and a fake egg with a hole in it. (The Silk to Egg props are a standard dealer item.) You also need a small glass. I use the largest possible silk so as to convey that if a silk is so large that it can be tucked into a hollow egg, there is no room possible inside the egg to conceal anything else. Cut the piece of tape into a circle about the same size as the hole in the fake egg. Then place this tape on the real egg in the same spot as the hole in the fake egg. The real egg and one of the silks are placed into the right coat pocket. The fake egg and the other silk are placed in the left coat pocket. In the figures, the fake egg is the one with the spots. The glass is on the table (or a chair) in full view. To begin, say;seemtobeanHudic;thatappreciatesthefinerpointsofmagic,soTri;I dosome-thingthat 1 rarelydo.l amgoingtoteadiyouamagictrickofyourveryown.Allyouneedisahandkerchief and alefthand." The left hand reaches into the left coat pocket, frn-gerpalm the fake egg, then emerge holding the silk. FIG. 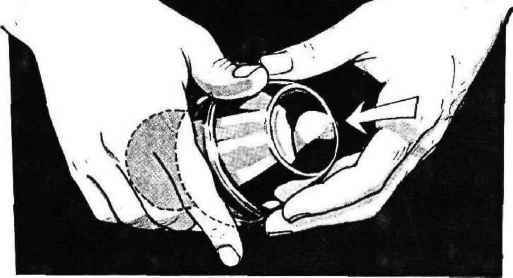 1 shows the egg in a fingerpalm position. 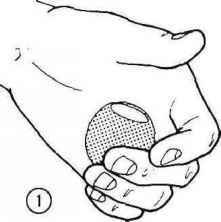 Take the silk with your right hand and wave it about; then stuff it into your Iefthand, actually pushing it into the hole in the fake egg. I have enlarged the hole in my egg so that I can quickly push the silk into the egg. Continue, "Oncethe handkerchief is completely in the left hand, all you need to do is make a magical pass..." Turn and gaze at a female in the crowd (or at a male if you are female) and say, "Hi there. "Continue, "Now we have an egg. "Open your left hand to display the egg. Make sure you don't flash the opening in the egg. Say, "The handkerchief has traveled invisibly into my pocket. Ta-da!" Remove the silk from your right pocket with your right hand (FIG. 2). Say, "I know some of you out there are thinking, 'How did he do i-Adi.' ijpourse, some :Vyou are thinking;, WHY did he do that?' Well, I did it to Aun:. : you how it was done. All you need is a FAKE^gg. It's made out of plastic... kid by a decoy! Anyway, you also need two handkerchiefs. Now I realize that revealing these key points seems like the whole picture, but be sure, you of the details. One iui!u;KC?'! :ii'>:!is in the right pocket. I will leave it hanging out... kind of a visual aid." If You Could Read Everyone Life A Book You Can Have Better Career, Great Relationships And Become Successful. This Book Is One Of The Most Valuable Resources In The World When It Comes To Reading the smallest and tiniest body Language and know what people are thinking about.